I had a much-needed and well deserved day off work today. I slept in…until 6 am, if you can believe that! Then I just stayed in bed reading until closer to 7 am. Finally got up and fed the cats, made toast and juice, took that upstairs and read Sunday’s newspaper while eating breakfast. What a pleasure to be able to take my time getting ready for the day. I did walk for 20 minutes. I went to a little park in the neighborhood. It’s hard to believe that I’ve lived here for ten years and have never stopped at that park. I’m definitely going to go back, with camera in hand. There was a lady playing with two large dogs in a field, nice walking trails, playground equipment, tennis courts, picnic tables, shelter houses. I had no idea that the park was so nice. So that was a fun experience. I also did some lower body strength training and range of motion exercises for my shoulder. I was surprised that my shoulder wasn’t bothering me more today. I did a lot of heavy lifting over the past couple of days at work…and the boxes are often too big for me to comfortably wrap my arms around (yes, that’s because I’m short…not much I can do about that). But my shoulder didn’t feel any worse today than it does any other day. 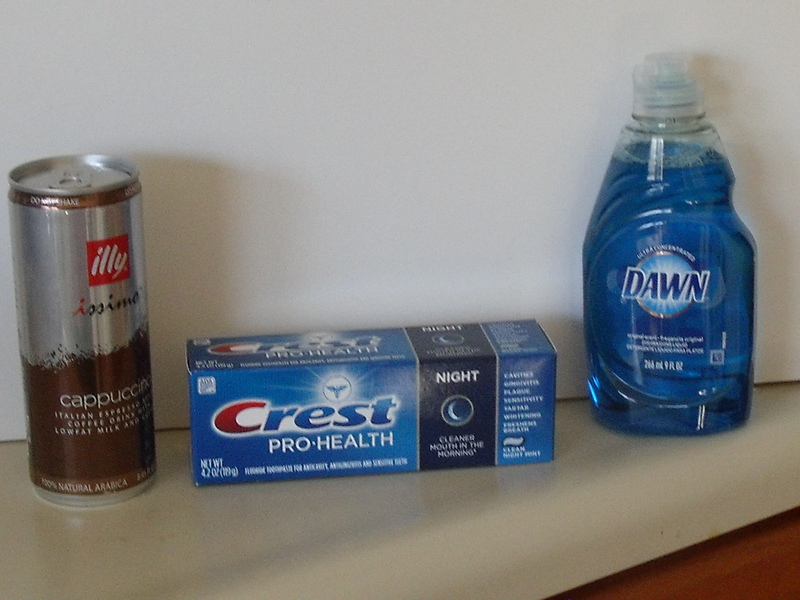 With coupons added to the sale prices and a $2 ECB, I ended up spending less than $1 for these items. Don’t you love saving money on things you use anyhow? 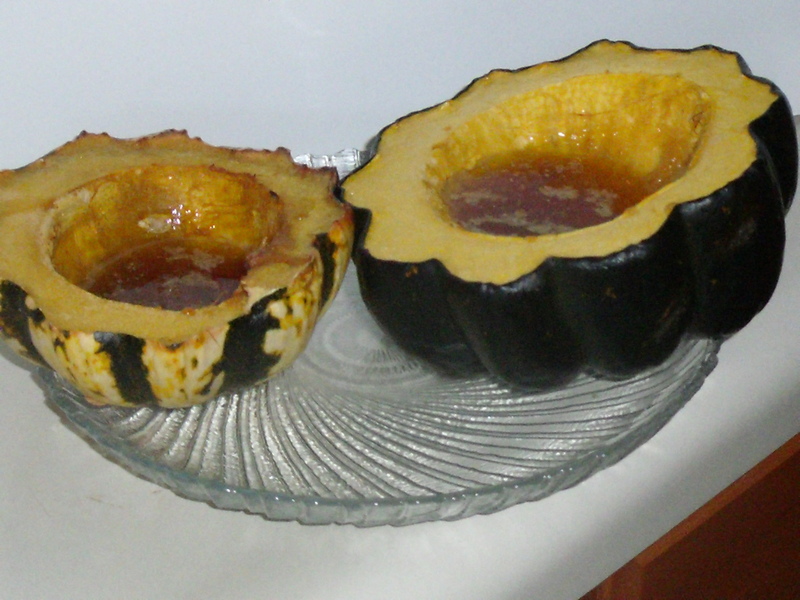 I did finally bake the squash I bought a few weeks ago. Makes for a quick, easy, salt-free treat. 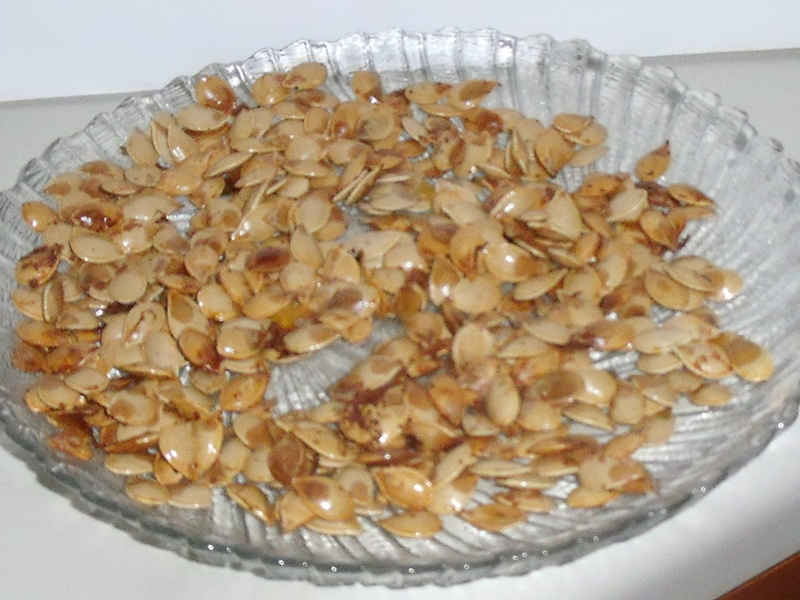 Have you ever roasted pumpkin or squash seeds? What seasonings do you use? I used a little olive oil and garlic powder for these. I also like Cajun seasoning. Okay, now I’m off to eat some squash for my dinner. Hey, how about that…that’s a vegetable…or is it a fruit? Well, no matter, at least it’s healthier than fast food, right? Whew!! What a crazy day at work…I’m exhausted, sleepy, in pain and in a bad mood…not a good combination, huh? I just could not get to sleep last night so ended up with a little over four hours of sleep. We went in to work at 5:30, the truck came at 7:30 and everything was hectic from that time forward. I ended up working 10 hours…just go, go, go all day long. My eating was good…had a really good cucumber, tomato and onion salad with my favorite Hendrickson’s sweet vinegar and olive oil dressing…yum! I’m thinking about having the same thing tomorrow. 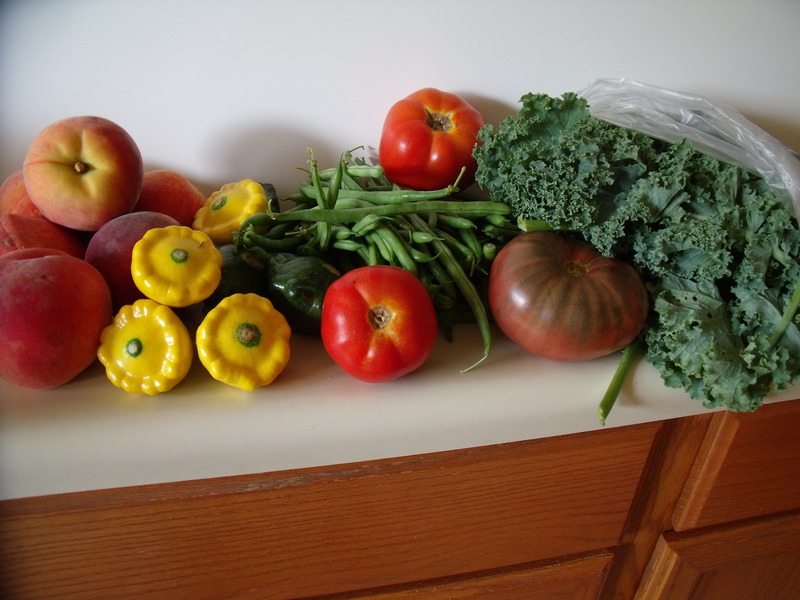 It’s nice to be able to go outside and pick the cucumbers and tomatoes for that salad…handy and tasty! I got in an hour’s walk today and did lower body strength training…oh yeah, and worked like a maniac on that truck…fun times! I’m planning to get to bed really, really early tonight…I’ve got to try for eight hours of sleep. When I combine lack of sleep and hunger, like I did at work today, it’s not a good thing. I get just a tad grouchy…what’s that you say? More than a tad…much more than a tad? Hmm…okay, I’ll give you that one. So, to any of my co-workers who I may have offended with my grouchiness, I’m sorry…one thing I know for sure, I need to stop and eat when I start feeling like that. How does being really hungry, sleepy and tired affect you? 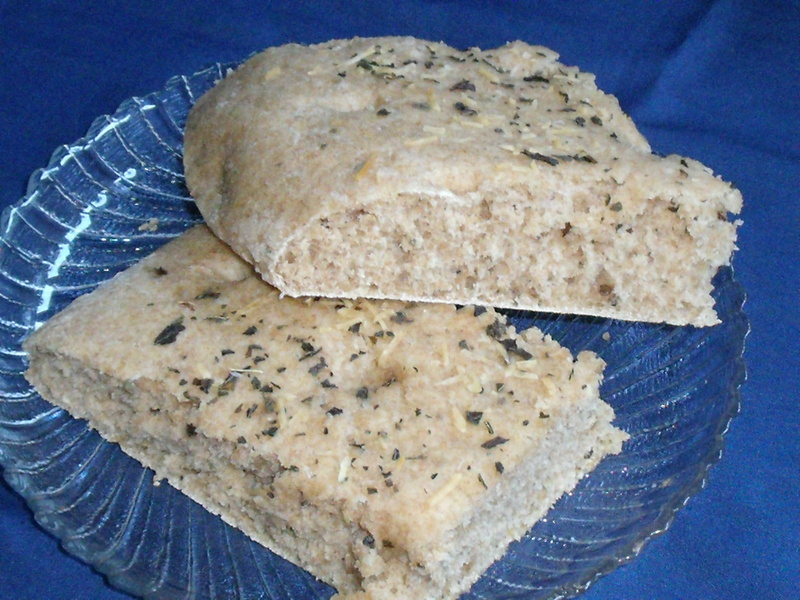 I read a blog yesterday where the writer had made the most beautiful focaccia… http://foodblogandthedog.wordpress.com/ Did I ever mention how much I love good bread products? Or how I find baking my own bread, kneading it, the aroma, one of my greatest cooking pleasures? Or how my dad actually taught me to bake bread (between his leaving us and coming back multiple times)? That’s one of the only pleasant memories I have of him, but hey, at least I can dig one up, right? 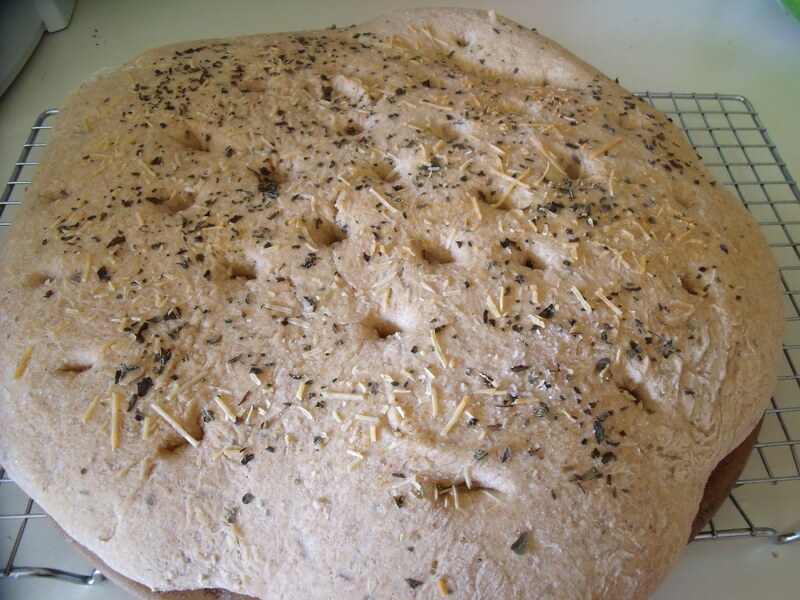 So anyhow, after reading that lovely blog, I decided I wanted to make my own focaccia today. I’m going to use it as the base of some mighty tasty veggie sandwiches for work this week. One of the things I’ve discovered about bread making is that you don’t really need a recipe. Provided you don’t kill the yeast but do get the liquid used to the correct temp (warm to the touch), your bread will turn out fine. So…today’s focaccia consists of whole wheat flour, a little white flour (I’ve never tried whole wheat bread flour, but have heard wonderful things about it, let me know if you’ve incorporated this in to your bread recipes), a small amount of sugar, oil, yeast, and warm water. I also added some dried basil…the blog I referred to earlier showed the basil cut into strips and placed over the top of the focaccia before baking…I told you it was beautiful. Mine isn’t as aesthetically pleasing, but oh my, did it ever taste good. I mixed everything together, then kneaded it for a while. Once it was the right consistency, I put it on a pizza stone and spread it flat to cover the stone. I then covered it with a towel and let it rise for 45 minutes or so (I told you this isn’t exact, didn’t believe me?). Once it had risen, I uncovered it and poked holes in it using my finger. 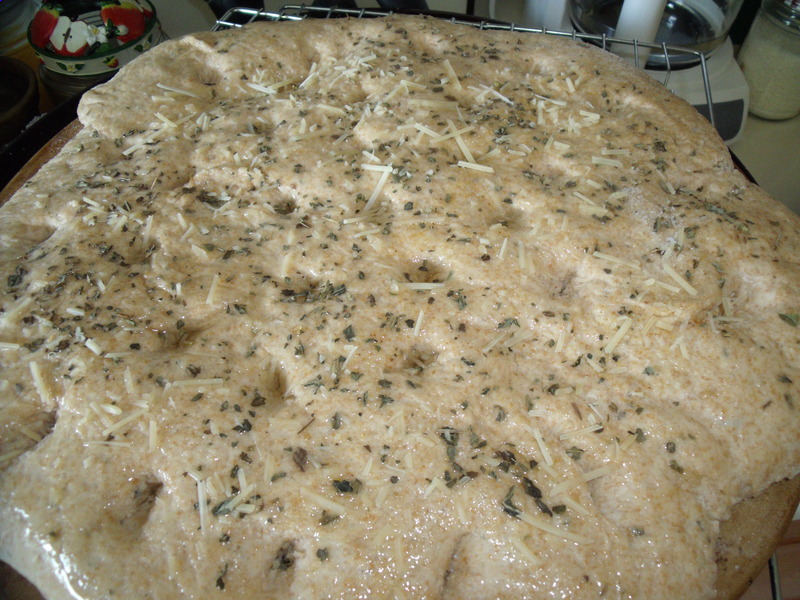 I then spread a little canola oil (olive oil would have been good too) over it, sprinkled more dried basil and grated Parmesan cheese (the real deal, not the stuff in the green can) over the entire focaccia. Then baked it at 350 degrees for 10 or 15 minutes. I didn’t want to overbake it, and the time was closer to 10 minutes than 15. Took it out of the oven and placed the baking stone on a wire cooling rack…this is totally unscientific, but I think things continue to bake when you leave them on the baking stone, even out of the oven. Anyhow, this turned out nice…soft, fluffy, not too dense, great taste. How’s that for a quick bread that is oh so much better than what you can buy at the grocery store? Watch out! Cooking can be dangerous. In anticipation of my return to work, I was cooking some quinoa today. The plan was to make a cold quinoa salad to take for lunch for the early part of the week. 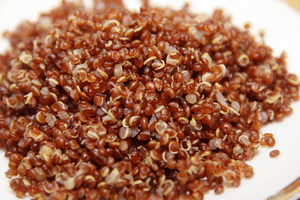 Quinoa is good for you, tasty, combines easily with a variety of produce to come up with a lot of different dishes. 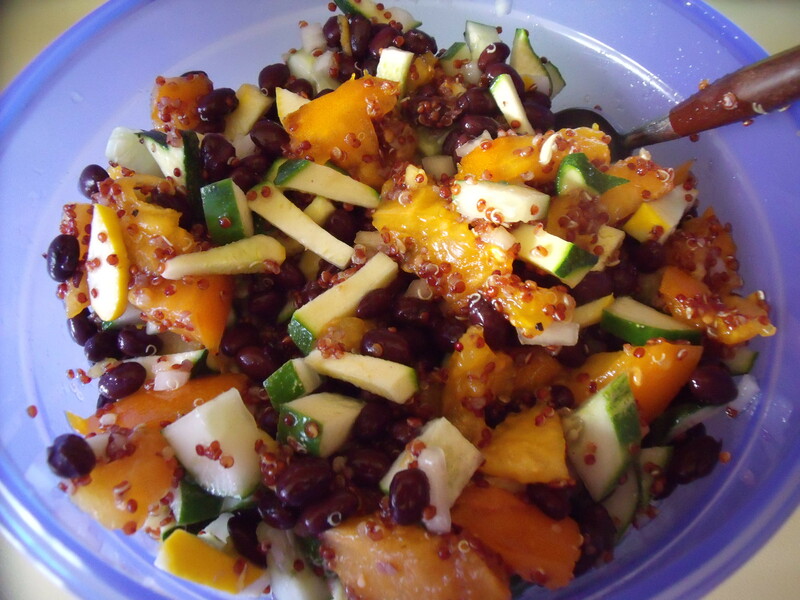 The salad I was making today had red quinoa, fresh yellow tomato, onion, cucumber, summer squash (both yellow and green) and black beans. 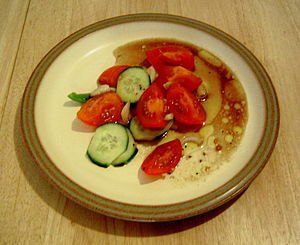 Then, of course, I used my trusty Hendrickson’s sweet vinegar and olive oil dressing (yes, again). The flavors meld perfectly to produce the most delicious summer salad. Since I’m trying to eat healthier food and avoid fast food restaurants, this works well for me…something I actually like and that has a lot of different veggies in it. I decided to cook the quinoa in the microwave since it’s so terribly hot today. No need to heat the house up unnecessarily…isn’t that what microwaves are for? So I measured out the quinoa I had left in my pantry (added quinoa to my grocery list) and used one part quinoa to two parts water. Put everything in a microwave safe bowl, tore off enough plastic wrap to loosely cover the bowl, put it in the microwave for 8 minutes. When the dinger went off, I opened the microwave door and noticed that the plastic wrap had puffed up. I lifted the edge of it up…children, don’t try this at home! Steam billowed over my right hand…ouch, ouch, ouch. I’m proud to say not even one cuss word escaped from my mouth…that doesn’t mean I wasn’t thinking them, but at least I managed to keep my nasty thoughts to myself. I left the offending bowl of quinoa where it was and walked over to the sink and ran cool water over my hand for a while. That helped, well, at least as long as I kept my hand under the running water. Kind of difficult to get anything else done with your hand under the faucet. So I decided to be a big girl and just deal with the pain. I sat down at the computer while the quinoa was cooling for 15 minutes…cooling, or sitting there, or something. Hey, the instructions say to let it sit there for 15 minutes then put it back in the microwave for another two minutes…so that’s what I did. See, I took my mother’s advice and never ran with the scissors, or stuck my hand in the garbage disposal, or took a pan out of the oven without using a pot holder (just kidding, she never told me about that, somehow I just knew that was something you didn’t want to do), but the steam…I’m sure somewhere along the line, she must have informed me about the dangers of steam, but it slipped my mind for about five seconds today…now I’ve got the burns as a not-so-gentle reminder…cooking is a very dangerous activity. The next time I hear someone say that they’re steaming mad, I’ll know exactly what they’re talking about. I didn’t set out to buy kale at the farmers market Saturday, but as I was perusing the assortment of veggies, someone stopped close to me. When I looked up (I always have to look up unless the person is maybe five years old), I saw it was Kai, a co-worker from days gone by. Kai had just finished her boot camp and sauntered on over to the farmers market in search of kale. She said she’d been eating a lot of kale chips and needed to replenish her supply. We talked for a few minutes, then went our separate ways. But the kale stuck in my mind. So I,too, decided to search for kale. Once I started looking for it, it was everywhere, it seemed. I finally decided on a nice curly kale, made my purchase and continued on my way. In case you don’t know, that’s the kale on the right side of the picture. My attempt at artistry…an heirloom tomato nestled up to a soft cloud of kale and crispy green beans. 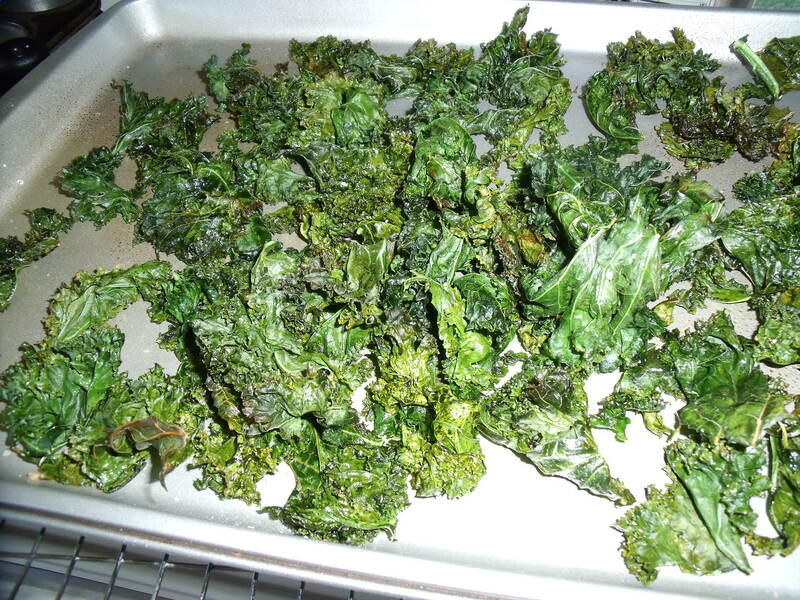 That nice fluffy mound of fresh kale bakes up into this crunchy bunch of kale chips. Way better for you (and more importantly, for me, since I’m going to be the one eating them) than any kind of chips you can buy at the store. Thanks, Kai, for reminding me how much I like these…and it was great running into you Saturday morning!! Those boot camps are doing what they’re designed to do…you look fab!! I finally made it to our local farmers market this morning. I have every other weekend off work and it seems like it’s always either raining or I’ve got other plans. But today I got up early, gathered my totes, put on comfortable shoes and made my way down town. I got there just a few minutes after it opened (operating hours are Saturdays, 8 am until 1 pm) while the crowd was still navigable. Believe me, with this particular farmers market, that’s the only way to do it. On occasion, I’ve gone at around 11 am and could hardly see the vendors’ booths through the mass of humanity. By going early, I was able to find my favorite vendors (there are several organic farmers who sell their produce and plants at the market, one of my favorites is a farm that is owned by a woman…one of these days I’ll remember to take a picture of her at her booth, but that didn’t happen today. It’s nice to be able to talk with the farmers who actually do the work to bring us all the fresh fruit and veggies. I like to hobby garden, but to do it on a large enough scale to earn money is a huge undertaking, not to mention, a lot of hard work! I have total respect for these people and thankfully, I get to enjoy the fruit of their labors. In addition to the produce, you can find honey, eggs, meat, freshly ground flour and cornmeal, all kinds of live plants, cut flowers, coffee, prepared food and lots of live entertainment. It’s really a social event for a lot of people here in my home town. 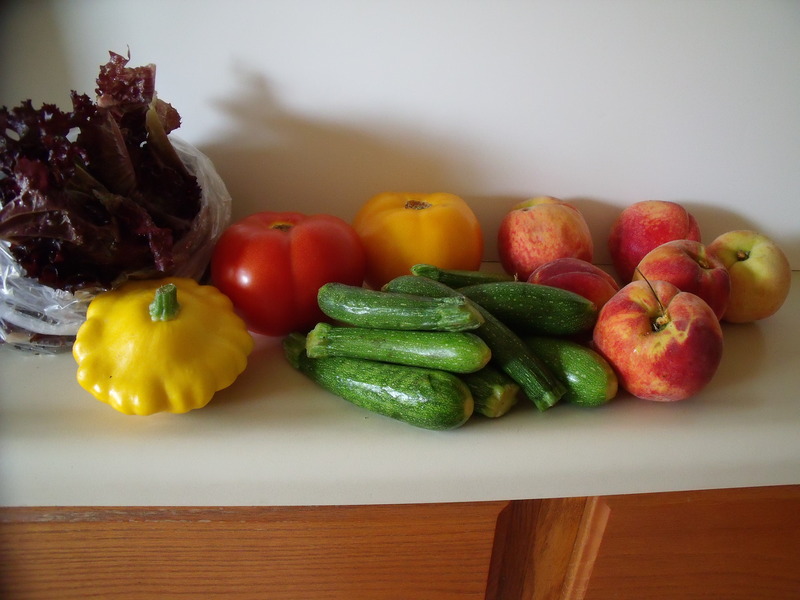 I came away with several baby zucchini, some juicy peaches (I ate one as soon as I got home), some red leaf lettuce, a Patty pan squash, a yellow tomato, and a red tomato. I think I’m going to grill the zucchini and the Patty pan squash, brushing them with olive oil first. 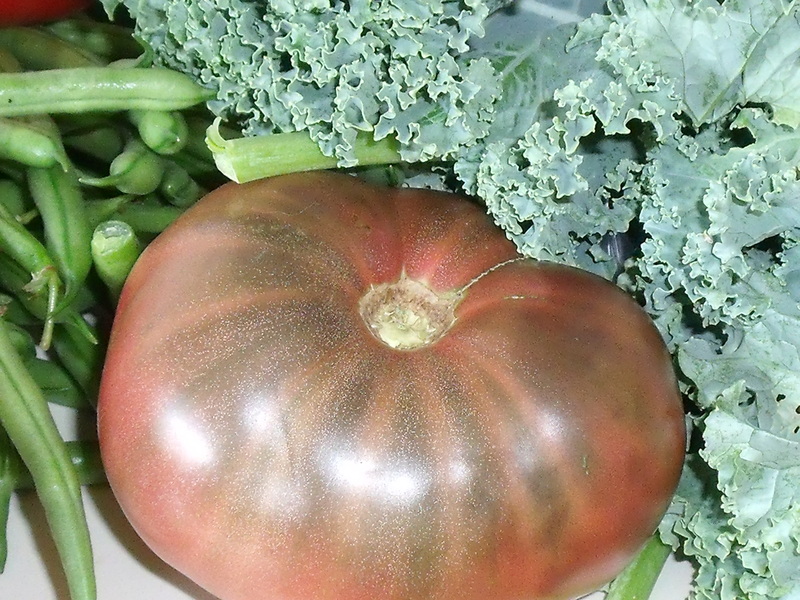 The red tomato will likely go into a nice fresh salsa, one of my favorite summer foods. The lettuce? Well, salad for work with tomato, cucumbers and peppers. And the peaches, really, do I have to explain? I will eat them out of hand…although I have read various blogs about grilling peaches and watermelon…should I give it a whirl? By the time I got home, it was beginning to get hot (we’re under a heat advisory today) and the humidity was making it a little difficult for me to breathe. I went out to look at my own little garden where I have several cucumbers ready to pick. And I noticed one of my Amish paste tomatoes is turning…ahh…to be able to walk out of my kitchen door and pick my own produce right before I eat it, it doesn’t get any better than that!! But the convenience and ambience of the farmers market comes in a close second! Okay, I know this isn’t the first time I’ve said this, but I really am going to work at regaining my health and fitness…and that begins today. I’m going to do some form of exercise every day, even if for only 10 minutes. That is to get me back in the habit of exercising regularly. After I’ve re-established that habit, I’ll work on increasing the intensity and length of workouts…well, I’ll gradually increase both intensity and duration each week. I’m cutting out junk food, cooking more real food, planning my meals and snacks for each day. I’ll weigh myself once a week and take my measurements once a month. I don’t feel comfortable talking about what I weigh, but I will tell you what I’ve lost or, heaven forbid, gained each week. I guess, by the time I’m closer to the end of this road (hmm…I guess the road to becoming fit and healthy turns into the road of maintaining that level of health and fitness, I don’t think the journey ever really ends), you’ll probably have a pretty good idea of what I weighed when I started (gasp), but for now, we’ll do things my way. I’ll talk about what I’ve eaten each day and probably about why I’ve eaten what I’ve eaten (stress? can you say work related stress?). I’ll also talk about what I’m doing to better cope with my life. We all know people don’t gain this much weight just because food tastes good, right? I totally get that I need to work on the underlying issues in order to conquer this problem once and for all. I know it won’t be easy, it won’t always feel comfortable, but it’s what I need to do in order to live the life I want to live, to whole heartedly embrace this life of mine, to be happy with who I am and where I am. 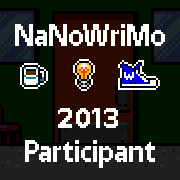 And I’m going to share my journey with you lucky folks…and if anyone cares to join me, hop aboard…we can work together. Total calories for the day (remember guys, I’m a girl)…1,595 which is right in the range where I want to be 1500-1800 calories a day. I know I’m going to have to do some tweaking in order to get in additional servings of fruits and veggies…once the bagels are gone (3 left), I’ll buy either the Thomas’ bagel thins or a 35 calorie whole wheat bread…that alone will save at least 150 calories to use on additional healthier foods. 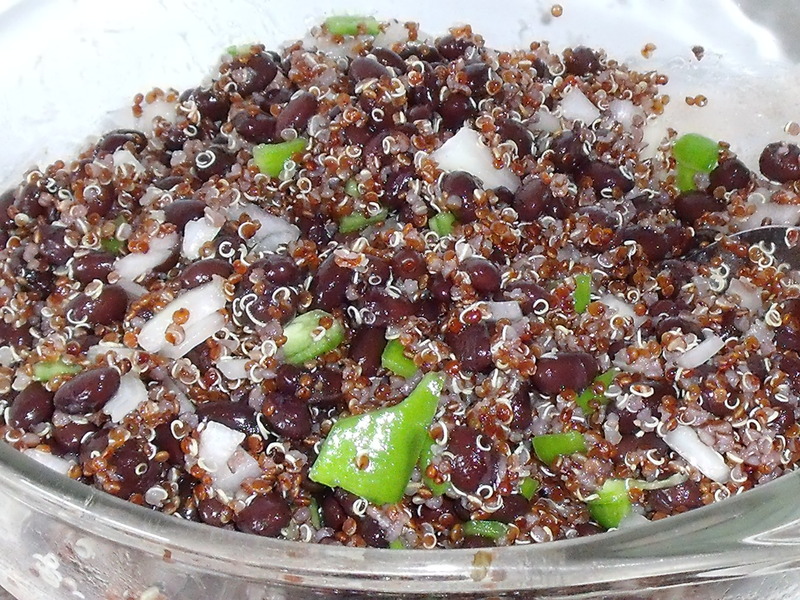 The quinoa and black bean salad is one of my favorite meals, so you’ll probably see it fairly frequently. 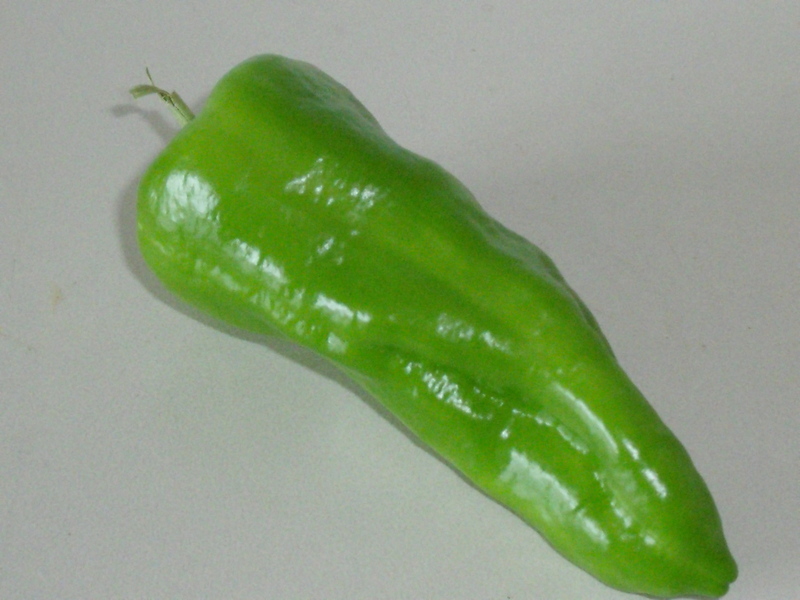 My first pepper of the season from my little patio garden. 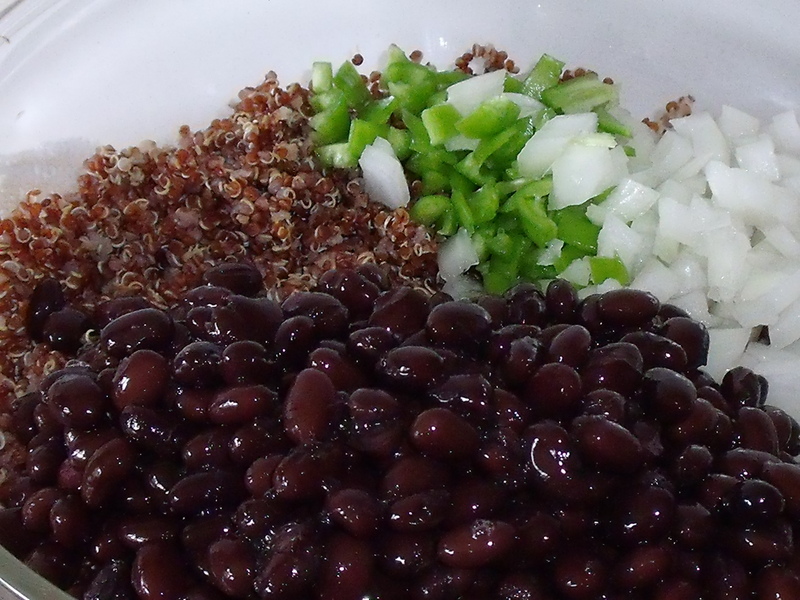 Chopped onion, pepper and black beans added to quinoa. 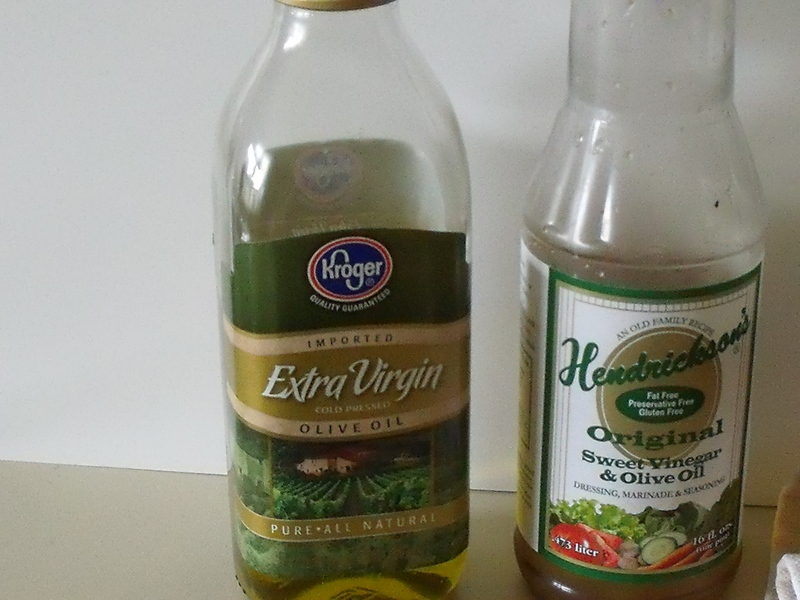 Olive oil and my handy-dandy Hendrickson’s sweet vinegar and olive oil dressing. The finished product..yum!! If I’d had tomatoes or zucchini in the house, I would have added them to the salad. That’s the great thing about this dish, you can put whatever you have on hand into it and it’ll be delish!! Go ahead, experiment!